I enjoyed the recent film adaptation of C.S. Lewis’ The Lion, the Witch and the Wardrobe. They did a better job than I initially thought they could. However, after watching the movie, I felt that there was something missing. After going back to the book, I realize what it was: Lewis’ narrator. His story is engaging, but the narration given in many key scenes is really the entire essence of a particular moment. 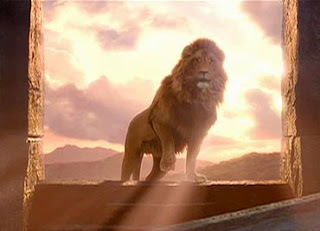 This phenomenon occurs repeatedly throughout the story, but one of the most significant ones is the sacrifice scene where Aslan gives himself up to the White Witch. Lucy and Susan held their breaths waiting for Aslan’s roar and his spring upon his enemies. But it never came. Four Hags, grinning and leering, yet also (at first) hanging back and half afraid of what they had to do, had approached him . . . The Hags made a dart at him and shrieked with triumph when they found that he made no resistance at all. Then others—evil dwarfs and apes—rushed in to help them, and between them they rolled the huge Lion over on his back and tied all his four paws together, shouting and cheering as if they had done something brave, though, had the Lion chosen, one of those paws could have been the death of them all. And even now, as they worked about his face putting on the muzzle, one bite from his jaws would have cost two or three of them their hands. But he never moved. In the movie, these scenes are visually depicted with much cinematic skill and excellence. However, without these editorial narrative details, the most powerful imagery and import of these scenes is lost. As a result, the viewer is bereft of the very details that make the scene the climax of the overarching story. 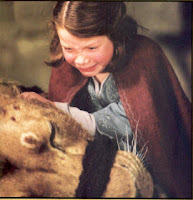 Though the White Witch claims the “deep magic” coerces Aslan into her hands, from the narrator’s perspective, Aslan willingly becomes this sacrifice as he lays down his life for his friends. Further, it is this very humiliation that he receives that makes Aslan “more beautiful and more patient than ever” to those who follow him. Through his words, Lewis is able to paint images on the canvas of his pages that dwarf their visually depicted cinematic counterparts.